Stirling's Smith Art Gallery and Museum has served Stirling for over 140 years. Often overlooked by visitors, overwhelmed by the splendour of the Old Town, it is one of our hidden gems. 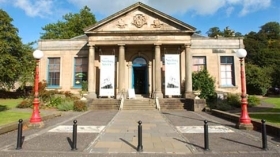 The Stirling Smith Art Gallery and Museum opened as the Smith Institute in 1874 with a bequest from artist and collector Thomas Stuart Smith (c1815-1869). It is a focus for the history and material culture of the Stirling area, and is managed by a board of Trustees. It is funded by Stirling Council with help from the business community and the 700- strong Friends of the Smith. Scottish history collections, fine art and archaeology are used in the main display called ‘The Stirling Story’ which explores the history of the town over the past Millennium. A changing programme of temporary exhibitions on a range of subjects and media, together with lunchtime talks and other events contribute to make the Smith a lively and welcoming visitor attraction. Other facilities include a café serving lunches and light refreshments, shop, lecture and conference room, and a biodiversity garden. Free admission, car park and access for wheelchair users. 2014 is an important year for Stirling, with the 700th anniversary of the Battle of Bannockburn, the 100th anniversary of the birth of the film maker Norman McLaren, the Ryder Cup and the 140th anniversary of the Smith itself. The exhibition programme during the year reflects this.